This is last Sunday’s strip from Arlo & Janis. I’ve mentioned before having older adults tell me how they used to run around barefoot all summer as kids, but that they could never do that now. It’s because they have let their feet atrophy. I did a bit of hiking last Friday. And I had something happen that happens only very rarely. I got a hole in my foot. Today’s comic is a classic. 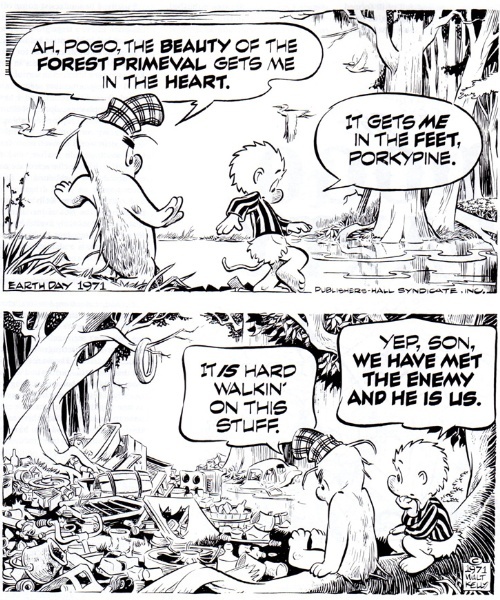 It’s from Pogo by Walt Kelly, and was drawn specifically for Earth Day in 1971. He originally drew a comic for the first Earth Day in 1970. This 1971 version is similar, but for the second one he added the piece that makes it particularly poignant for barefooters.